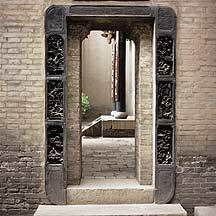 The doorway or gateway to anything is important. 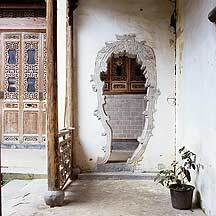 It lets the guests or trespassers know what is to come. 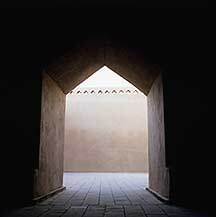 The Qu compound is long. 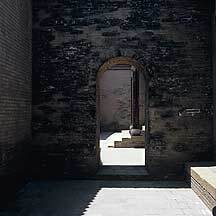 Its courtyards are planned one after another through a series of doorways in a linear direction. 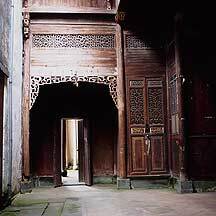 From the entrance to the back, there are 5 doorways -- one goes up higher than the other along a 99 meter long path. 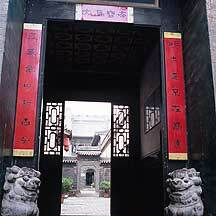 Doorways to the family's theater. 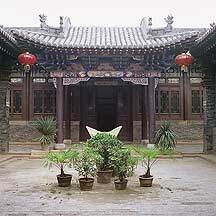 The theater is an important area for family and guest gatherings, so it has to be grand. 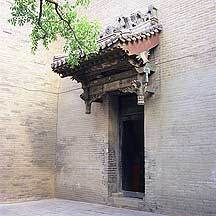 Less decorative doorways on the sides that lead to other courtyards. 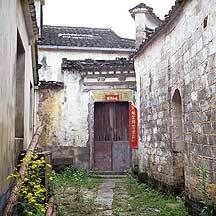 Between courtyards are these small doorways. 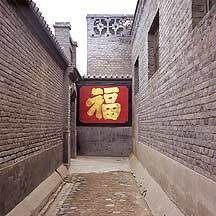 They usually break the monotony of walls everywhere. 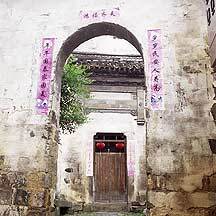 One of the doorways (this one is call 琳碧(Lin Bi) that opens to the main courtyards. 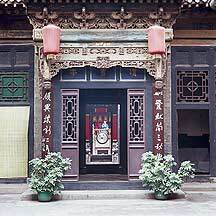 Another one of the richly decorated doorways. 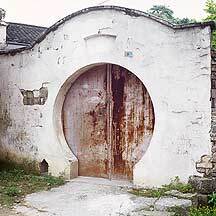 The heavy duty metal door seems a little inappropiate. 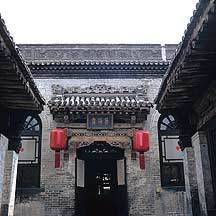 Another courtyard. 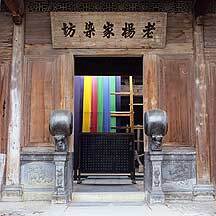 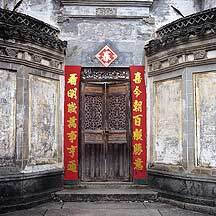 The sophisticated doorway has a well-decorated eave supported by painted 斗拱dougongs (brackets). 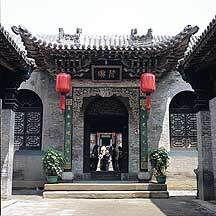 In front is a stone sculpture in the shape of a 元宝, a standard Chinese gold nugget. 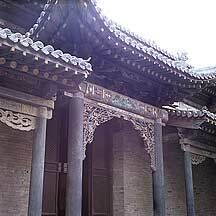 In the back is a grand 门楼(menlou), a structure consists of a set of columns that supports the 斗拱(brackets) that in turn support the protruding eave. 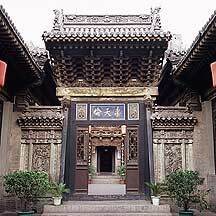 门楼(menlou) is an essential part of Chinese architecture. 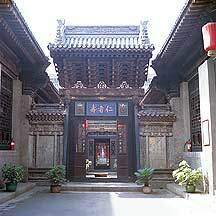 The front entrance, which is located on the south side of the rectangular compound. 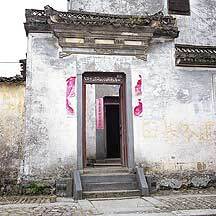 The tourist entrance was around the corner on the east side. 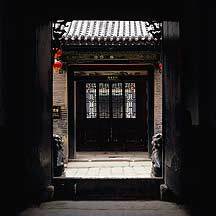 The extraordinary and intricate 门楼(doorway architecture) is typical of wealthy homes and is a sign of importance. 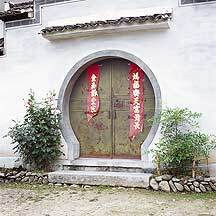 A residential doorway in a hutong. 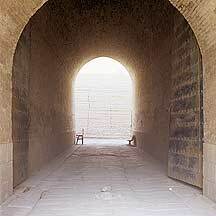 The arch tunnel of the west gate. 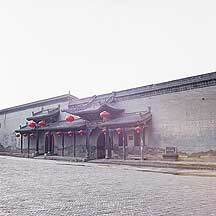 上海Shanghai: Today, the financial center of China as well as one of its cultural centers. 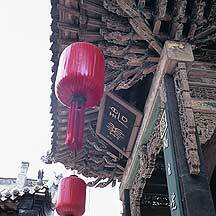 Fashion lovers, misfits, intelectuals, dreamers, refugees, outcasts, and outlaws alike rush to Shanghai for its haven and riches. 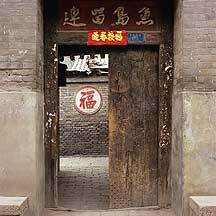 You come to Shanghai not for any historical attractions, but rather for the city itself -- its interactions of all things good and bad that generate hot gossips.